Hi everyone, I hope you’re all well. I have some very good news, I have finished my latest painting!. As some of you might remember, or not, I have been producing a painting of Arsenal Tube Station, located in Central London. The station is 5-10 minutes away from the Emirates Stadium, and is the main Tube station for the football Stadium of my beloved Arsenal. Arsenal are a huge passion of mine, and it has been really, really fun and enjoyable for me to paint this. I know from some of my followers this is going to bring some good ribbing, which is all good fun, but I hope everyone from Arsenal fans, non-arsenal fans right through to people who don’t follow football, will like and enjoy the image. I’m really pleased with how its come out, from the Bright red’s and Yellow’s of the flags and shirts, to the old style london housing around that area. As usual, the painting and a set of limited edition prints are available to buy from the Gallery that represent. The link is below. I already have my next image ready to go and produce, so keep an eye here for more details in the next few days. A little hint though, its superhero inspired!. Have a great week everyone and speak to you soon!. 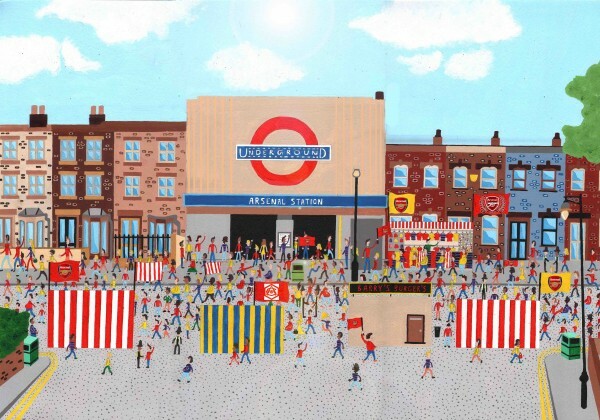 Read more about… Arsenal station on Matchday.